We take Noah to occupational therapy every other Monday at Our Children’s House at Baylor in Dallas. We use OCHB for Noah’s physical and speech therapy as well, and have very happy with his progress. Early intervention is very important for children born with Down Syndrome, as they are often delayed in reaching their developmental milestones. Noah’s previous occupational therapist took a new job out of state, so today was our first appointment with his new one. Noah’s leg and back muscles are getting really strong, but he still has some work to do on developing his core (stomach) and arm muscles. So the next step for him is developing those two important areas as they help him sit up (which he needs to do to eat), grasp objects, and eventually crawl and walk! This little guy is getting so strong! In the video you’ll see the occupational therapist doing several new exercises with Noah. In the first one the goal is to get Noah to press up on the small exercise ball in order to help develop his arm and core muscles. In the second one the therapist is moving her head from right to left and trying to get Noah to follow her. The goal is for Noah to track with her, and move his body in the direction she moves her. This also helps develops those core muscles! One of the many things we’ve learned from Noah’s occupational therapist is how occupational therapy can help a child born with Down syndrome learn to play. And who doesn’t like to play? In the last exercise Noah is arched across his therapist’s legs while he tries to push up with his arms, and hold that position for as long as he can (think half push-up!) This is very hard work, and obviously helps to develop strength in his tiny arms! Even though it’s hard, our little guy did an incredible job! This little boy is a real trooper. He goes to so many appointments, and has to work so much harder then a typical child. Tomorrow, and Wednesday we will spend more time at OCHB when we go back for his physical therapy visit. I sure wish Noah didn’t have to do so much hard work, and could just get stronger on his own (without all the therapy appointments) like typical children. But It’s ok. I’m thankful to live in a place with so many great resources to help him grow and develop. My wife and I don’t mind taking him to a million appointments if need be. If fact, we consider it a joy! Noah is our second priority, with only God being the first. Everything else is in our life is of little importance. Man, oh man, we love this kid! Every day the Words of Psalm 127:3 ring more true to me. We are surely blessed. While your here, please take a second to receive our daily post via email. Thanks! What has been your experience been with your child’s occupational or physical therapist? Are you happy with them? Way to go, Noah! Austin and I are cheering you on. I’m glad you left a comment, so I could find your blog! Great job!!! 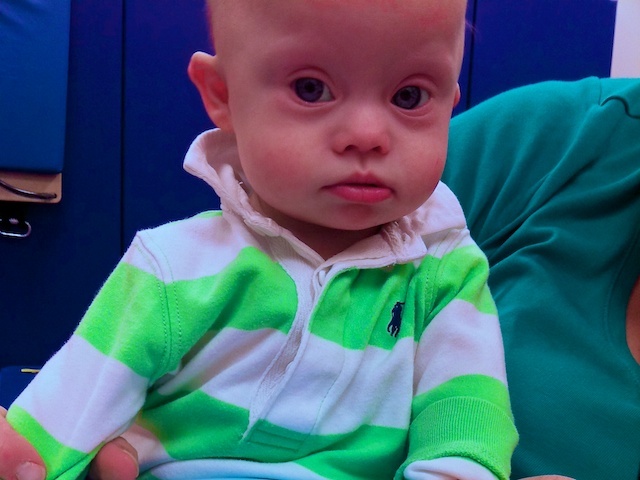 So many blogs from families raising a child diagnosed with Down Syndrome are LAME! But your’s is great! Good job! Austin is A-D-O-R-A-B-L-E! I can’t wait to read through the posts so I can catch up on your journey! Your site is defiantly going on my reading list! You can keep up with ours by visiting http://sweltering-berry.flywheelsites.com/subscribe! By the way do you guys go to any of the DSG meetings? And what hospital do you guys typically go to? My wife is a pediatrician at Children’s…. What a beautiful little boy you have! Such a joy. I found watching this video very inspiring, what a tough little man you are raising. As a student teacher who is very interested with special needs and the importance for inclusion, I think you are doing an amazing job letting the world know how incredible and deserving of love children with special needs are. It was also great as my daughter (who doesn’t have Downs Syndrome) is having some trouble reaching her gross motor milestones, such as sitting, and enjoying the dreaded ‘tummy time’. We go to a physical therapist, but it doesn’t hurt to get some more ideas. You and your family are heroes for sharing your journey with the world. Noah might not be a ‘typical’ child, but he sure is a lucky one. I have a precious 10 month-old granddaughter who has Down Syndrome and has just been approved to begin Occupational Therapy. I live in Arizona so I’m not as involved as I wish I could be, but I know your blog will be very helpful to me. My son and daughter-in-love are also in the process of adopting a little boy who will be three next February. He absolutely adores his baby sister, and all of us (grandparents and aunts and uncles) know how blessed we are to have both of them. They’re God’s greatest gifts in our lives! We can’t wait to see how He uses them in their world! Hi I have a 3 month old daughter and so far I have met with a OT twice since she has been born. I am trying to get PT for her and there is a long wait. I am wondering how often and how old was Noah when he started receiving therapy? Also did he receive OT PT and speech right away or did he start with one therapy first? This is all new to me and would really like to be proactive and want her to start early in age hoping it will benefit her in the long run. I feel like I am being told different things. You seem to be doing an amazing job with Noah and I would like to know what your process was. Thank you! All praise be to the One who blesses you both with this beautiful, peaceful looking boy. He is working so hard and I appreciate your sincere efforts of helping him to reach his peak. May Allaah, the Most High reward you both with good in this life and the Hereafter aameen. My husband and I are also blessed with a little girl who has down syndrome. She is very precious to us and to her siblings (she is our sixth child). May Allaah protect our offsprings and preserve them upon what is pleasing to Him aameen.